JBL recently announced some details about the Flip 5 Bluetooth speaker, which it promises to release in “spring 2019”. This is an update to the JBL Flip 4, a quality and quite affordable portable Bluetooth speaker. While the Flip 4 was not our top-choice small Bluetooth speaker for travel, it was near the top of the list, and its low price can make it a fantastic alternative. JBL unveiled its Flip 5 plans at CES Las Vegas 2019, the global consumer technology conference. A number of tech reporters took a peek at the plans, and we’ve compiled everything that is known so far and put it into a comparison chart with the JBL Flip 4. We’ll follow that with our analysis of whether it might be worth waiting for the new model, or just picking up the (cheaper!) Flip 4. Is it Worth Waiting for the JBL Flip 5? Hard to say, but we probably wouldn’t wait given the expected higher price, and that it’s never a sure thing that an upgrade will sound better than the model that preceded it. This is true for JBL speakers themselves in fact; the JBL Flip 4 was widely seen as an improvement over the Flip 3, but the JBL Charge 3 was often panned by critics for not sounding as good as the model prior, the JBL Charge 2+. The various audio and tech geeks who have carefully listened to the Flip 4 gave it generally high marks for even performance and strong volume. However, when compared to the UE Boom and Bose lines, it doesn’t offer quite the bass response or punchy performance, and the Bose Revolve and Revolve + in particular can offer more even performance and separation of instruments. Nobody can say yet exactly how the JBL Flip 5 will sound, though we of course hope it will sound at least a bit better, and JBL is promising more volume and stronger bass. The new racetrack audio driver, size unspecified as yet, has been revamped to provide crisper definition. Some of that bigger power will probably mean more battery drain, but don’t worry, the JBL Flip 5 will have a much bigger battery to match, at 4800 mAh (compared to the Flip 4’s 3000 mAh). The overall advertised battery life is the same in the end for both speakers: 12 hours. But JBL has also suggested that the Flip 5 will be able to play at its highest volume for 10 hours (it doesn’t explain under what circumstances it plays for 12). The other obvious difference is the USB-C port on the Flip 5, as opposed to the old, trusty mini USB-B jack that we’re used to on the Flip 4. We couldn’t care less about this, but JBL is excited that the new port is waterproof and doesn’t need a cover flap as the JBL Flip 4’s mini-USB did. We suppose it’s one less thing that can break, and the USB-C also means that you’ll be able to use the same charging cable as you do with other such phones and computers purchased in the past year or two. As for that waterproofing, both the Flip 4 and Flip 5 are IPX7 waterproof, meaning that they can withstand a 30-minute dunking. You shouldn’t listen to them underwater, but if they fall in the pool or sit in the shower with you, it’s not a problem. Both also have a speakerphone function, though we think you’re much more likely to just use the speakerphone function directly on your phone. Like the Flip 4, the Flip 5 will come in a very wide range of colors: 11 are promised for the new speaker. Wrap-Up: So What’s Right for You? There are always newer, greater things on the horizon. Because Bluetooth speakers contain batteries, and all batteries have a limited number of recharges in their lifespans, you’re usually going to have to replace your speaker after 2-5 years. So this is not a decision for life. 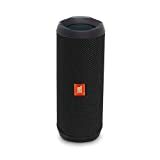 If you’re getting antsy for the JBL Flip 5, however, you can check this Amazon search or JBL’s shopping site for an eventual listing.